Please come donate and dance with us! Join before Valentine’s Day for only $2.14!!!! Expires 2/28/18. 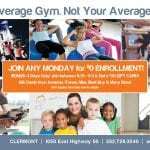 *New members only ***Join any Monday and get a free month!